Today's Draw: Four of Sword from the Steampunk Tarot by Barbara Moore and Aly Fell. Are you overly focused on a problem or issue right now? Do you often find yourself playing things over and over again in your mind, even when you have no control over what happens? Do you tend to feed the very thing that's eating at you? The Four of Swords is usually a card of rest. And that's how it is in this card, too. 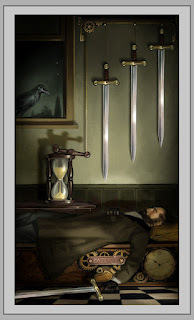 But there's an added nuance in this card—the contraption holding the swords above the man's head suggests that some inevitability is coming to pass and it's not likely a good one. Circumstances have been set in motion and it's only just a matter of time. At first glance, it may seem like he's sleeping when he ought to be racking his brain for ways around the issue. But sometimes taking a break from all the stress of a situation is exactly what you need to come up with a brilliant solution. You know how it goes when faced with an unpalatable situation. You start imagining worst-case scenarios. Your fears start coming up. And your brain tenses around all of this as you desperately try to figure out a solution. And while chewing it over can often help, the more stress you put behind trying to figure out how everything is going to turn out, the more you close your head to hearing divine inspiration. Right now I'm all worried about my boy dog who has to go in for surgery tomorrow. It's a situation in which I'm powerless and imagining all manner of outcomes. But really what is that getting me? What's going to happen is what's going to happen. And any fears I call up are just going to put fearful energy behind the situation. I don't want that. So I may as well just still the mind and go that place where I know everything happens the way it's meant to. Even if there were a problem I could solve in all of this, worrying won't get me anywhere. So if you've got a heavy problem to solve or a worry on your mind, take a nap. Meditate. Read a book. Or do any manner of things to take a break from the situation. You may just find that the second you stop thinking about it is when the universe steps in with its wisdom.